Next Stop: Food | Food Blogger located in Sydney Australia: Bellagio - Brunch Dates! Don't you just love the warmth instead of the harsh Winter cold? 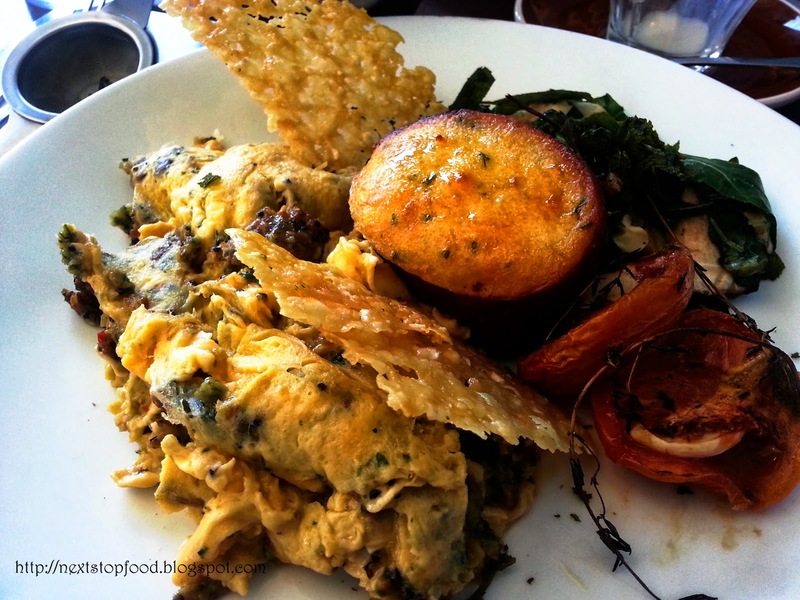 Bring on the brunches to enjoy the sun along with catch up talks! Here's a little collaboration of the brunch dates that I went without my foodie girlies so there's only 1 dish per cafe. 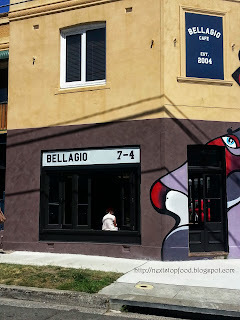 This cafe is located at Waverley/Charing Cross which is around 5 minutes from Bondi Junction. Charing Cross brings back high school memories when we used to go to cafes to buy milkshakes during lunch! Good times.. I don't think Bellagio was opened yet when we left high school because I have no recollection of it. The falafel scrambled eggs were interestingly yummy and the falafel certainly made the dish really filling. The confit tomato was unfortunately way too salty by itself, it needed to be eaten with the other elements of the dish. On the other hand, the kale smash and mushroom were UH-MAZING. There's also a polenta "cake" in the dish, I liked it because it was kind of sweet and acted as my "dessert". Oh, the avocado was missing from my dish.. Also, my friend unfortunately suffered diarrhea after our brunch date, we are guessing it's from her poached eggs. One of the waitress' service was quite rude. Hello the famous busy Four Ate Five, luckily we only had to wait for around 20 minutes for a table. It just gave my friend and I more time to catch up! OMG. 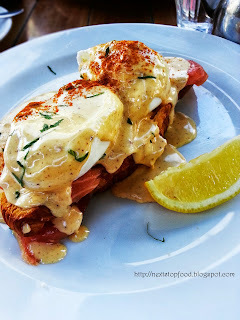 I think this is the best hollandaise I've ever tasted, I LOVE the tanginess of the sauce. The portion of egg, salmon and croissant was perfect , you know how sometimes before you finish the bread, all the eggs/salmon is all gone and you're left with just bread ? This is NOT the case in Four Ate Five! Their quality of food makes me not surprised that people are willing to wait for table. I was meeting up a friend near Chinatown and I was craving for cafe food so we went to Home Cafe because Home Thai is delicious so I know Home Cafe would be the case as well. I forgot to note down the price of the dish, but I think it's around $16. 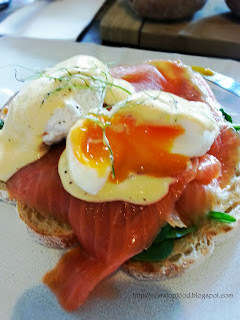 Love the runny yolk and they were generous with their smoked salmon! Definitely loving the sunshine these days - and longer days too! Brunches are awesome. The eggs benny at FourAteFive looks delish - it's often so hard to find a good hollandaise!